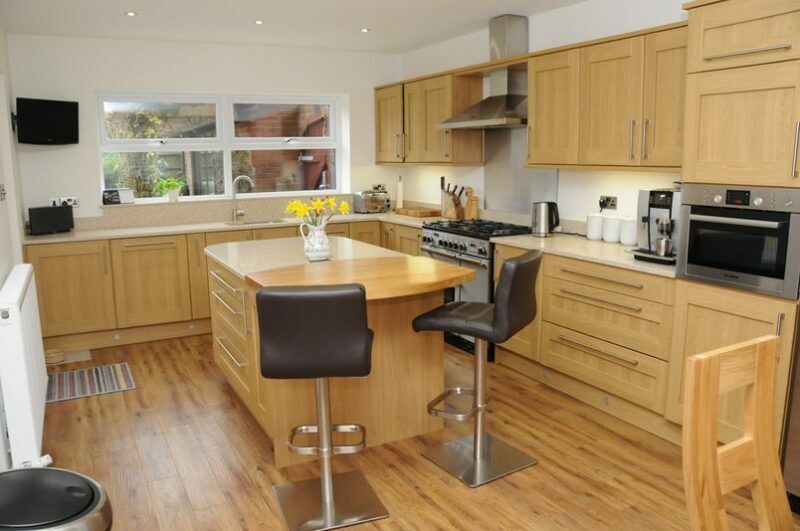 We are very pleased to show off this stunning kitchen in Standish. 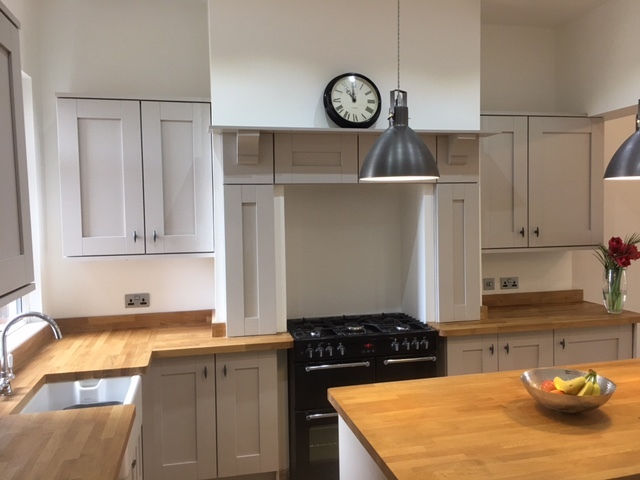 We worked hard with the customer from the design stage to the fitting, to give them everything they wanted so the kitchen is in keeping with their period house. 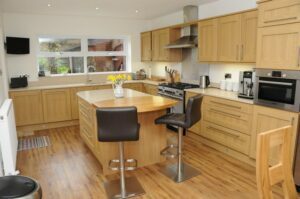 The beautiful solid oak worktops are complemented by cashmere shaker doors and a black range cooker. The island unit has a large drawer pack, with additional storage and a book shelf. Another one of our amazing kitchens – fantastic white gloss kitchen in Bolton! 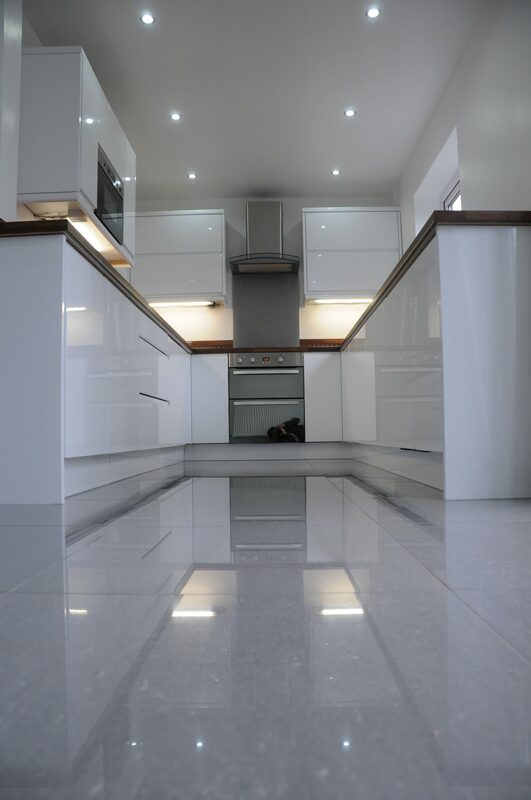 Fitted with top quality square edged laminate worktops and porcelain floor tiles , stunning. 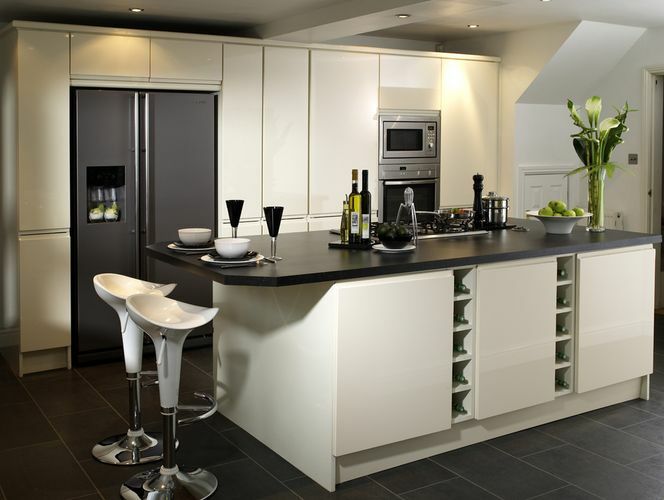 What an impressive combination of matt textured and gloss doors, with grey quartz worktops. 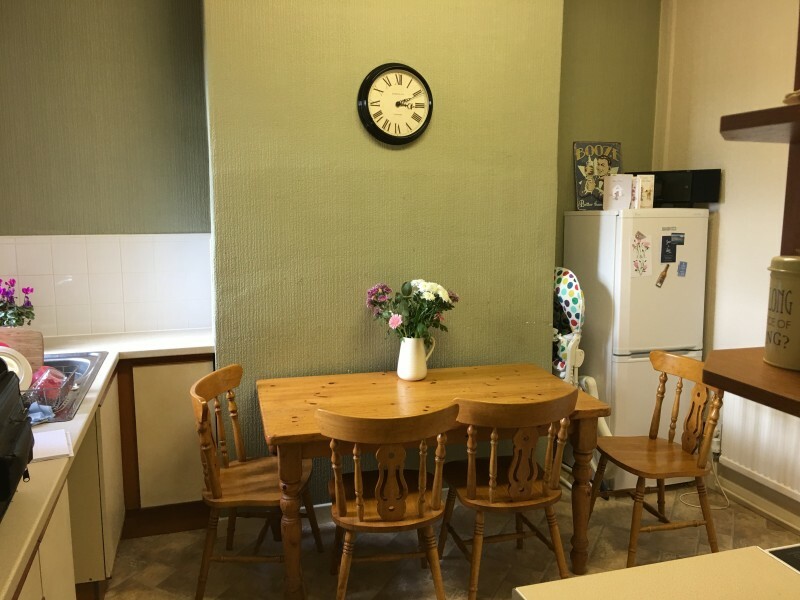 This beautiful hand painted kitchen was part of a larger building project in Leigh. 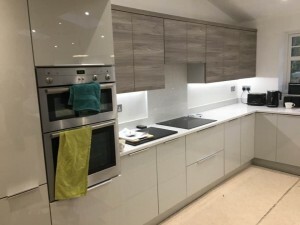 To create an open plan living space, with kitchen, dining room and snug, we removed the kitchen wall, blocked up a window and back door then fitted new french doors. We are very proud of this trendy kitchen installation in Wrightington, Wigan! Using on trend colours, texures and chunky panels, we created this modern two toned effect of matt stone grey with walnut woodgrain. 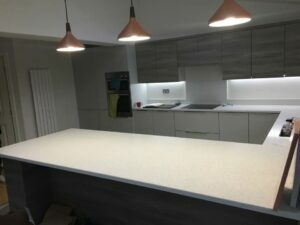 The before and after shots show just how much CK Installations can transform your kitchen into something amazing! 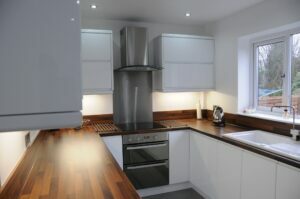 Solid wood and quartz worktops are a popular choice in kitchens. 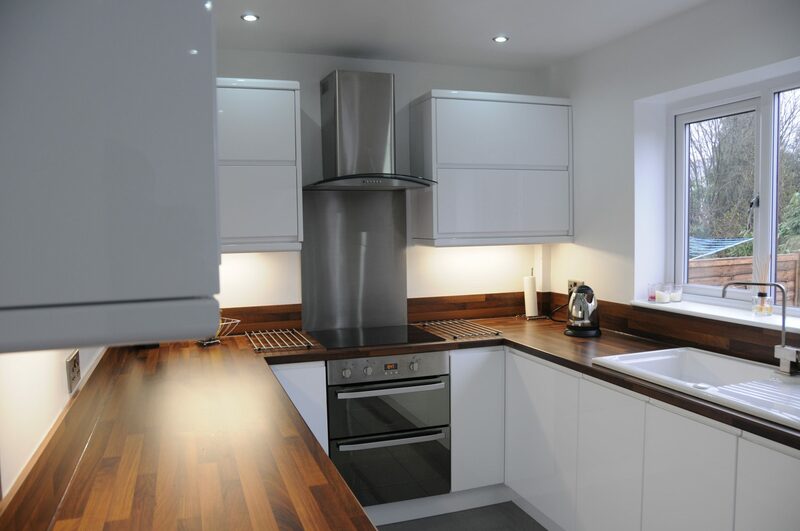 On this Standish kitchen, we have mixed the two together to create a blend of textures and materials. The bespoke oak breakfast bar sits beautifully next to the Silestone Quartz surface. 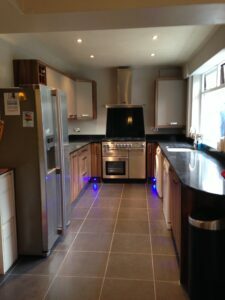 We can do any shape of wood or quartz, in a variety of colours and finishes. Here are some of our gloss kitchens installations, using our clean-lined, uncomplicated handleless door range. 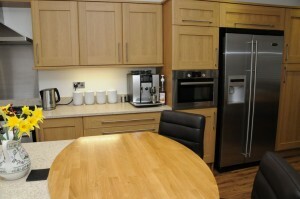 They are available in any size and in a wide choice of gloss or matt colours, with silver or matching backs. The first job actually appeared in our suppliers brochure as they were so impressed with the over all look! Grey gloss kitchens are a current trend that we love at CK Installations. 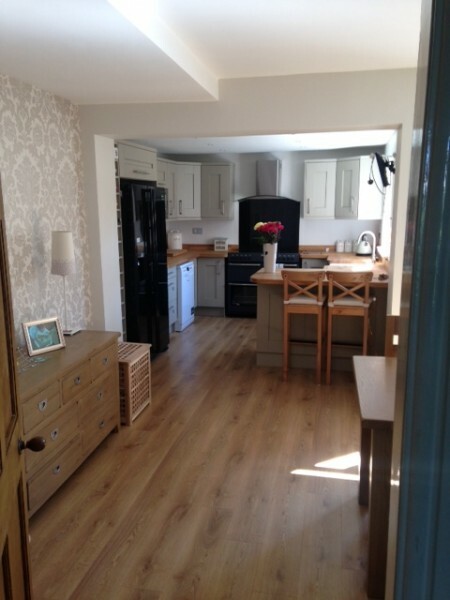 Here are 2 examples of kitchens we have completed in Standish. 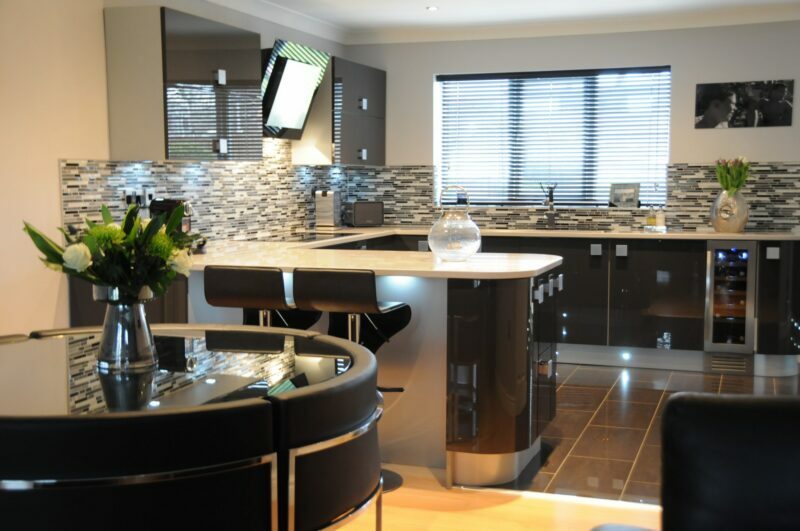 The first stunning kitchen was created using dark grey lacquered curved doors and Silestone Quartz worktops. The mix of mosaic wall tiles and dark grey porcelain tiles really sets this kitchen apart from the rest. The sleek design and modern appliances make this installation one of our best yet.